Genomic imprinting or parental imprinting is the phenomenon that occurs when the expression of a gene depends upon it being inherited from the father or mother so that when the copy inherited from the mother is active the father is silent and vice versa. As diploid organisms, mammals have two copies of every gene. One set is inherited from the father and one set is inherited from the mother. In an interesting scenario, some genes are only expressed from one parent. 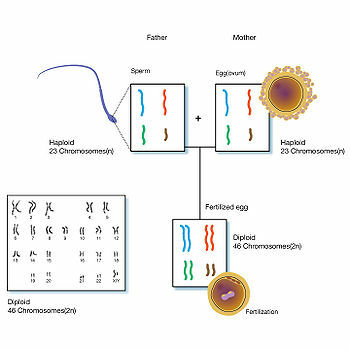 In other words, the gene for that particular set is inherited in a “silenced” version from one parent and an active version from the other parent. This example of epigenetic inheritance is based upon DNA methylation. The silenced gene copy is methylated and the active gene copy is not. DNA methylation is a way for the cell to distinguish between two sets of genetic information that may be identical apart from the methyl groups (Alberts, et al., 469). It is currently thought that 80 such silenced genes exist in the mammalian genome located primarily in several distinct chromosomal clusters. ↑ Alberts, Bruce; Johnson, Alexander; Lewis, Julian; Raff, Martin; Roberts, Keith; Walter, Peter (2010) (in portuguese). Biologia Molecular da Célula [Molecular biology of the Cell] (5th ed.). Porto Alegre: Artmed. p. 468-469. ISBN 978-85-363-2066-3. ↑ Hunter, Philip (May 24, 2008). "What genes remember". Prospect Magazine. http://www.prospectmagazine.co.uk/2008/05/whatgenesremember. Retrieved June 13, 2013. ↑ Karp, Gerald (2008). Cell and Molecular Biology:Concepts and experiments (5th ed.). Hoboken, NJ: John Wiley & Sons. p. 530-531. ISBN 978-0-470-04217-5. This page was last modified on 14 June 2013, at 12:34.